Watching the Bellagio Fountains is free in Las Vegas. Photo by Kristen. Traveling to a new place is a one of the most unforgettable experiences you can have in your life. But we all know that vacations can be expensive. That is exactly why I’ve found ways to save on traveling all over the world. One of the most effective ways to save money on traveling is simply to find free things to do. Just like the list of free things to do in Chicago, I’ve found free things to do in Las Vegas. In a city with expensive shows, high-end stores, luxury accommodations, five star dining, and gambling every direction you look, you can easily make Vegas your most expensive vacation yet. Vegas might seem like an expensive city to visit, but here are seven things to do that won’t cost you anything. Many of these attractions are family friendly too! 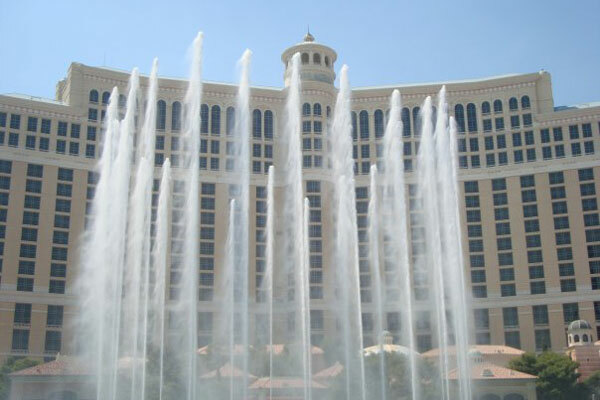 Right outside the luxurious Bellagio hotel, sits the fast-moving Bellagio Fountains. 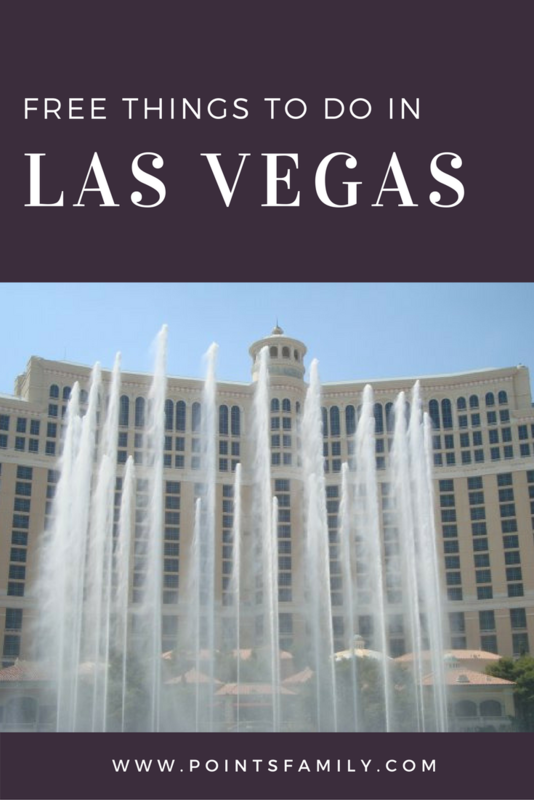 While it might cost you more than you’d like to stay in the Bellagio hotel, dine at one of their restaurants, or play in the casino, the fountains you can enjoy for free. This isn’t just your basic fountain though. These jets move perfectly to music throughout the day and at night, they glimmer with beautiful lights. Music ranges from opera to Elvis to broadway to classical. The shows run every 15 or 30 minutes depending on the day of the week and time of day. For more information on these free fountains, check out their website. Location: Bellagio, in front of the hotel, 3600 Las Vegas Blvd. The pirate and treasure theme spills outside of the Treasure Island hotel during their musical, colorful performance. Pirates perform a short performance with music, dancing, and fire on the pirate ship positioned right in front of TI. Location: in front of Treasure Island, show times are daily at 5:30 p.m., 7 p.m., 8:30 p.m., 10 p.m., 11:30 p.m. Whether you’re staying there or not, stop by the Flamingo hotel to see the Flamingo Wildlife Habitat. Besides being home to Chilean Flamingos, there’s also plenty of other animals including swans, turtles, and ducks all surrounded by beautiful waterfalls. Location: Inside the Flamingo Hotel. Shows in Las Vegas could be expensive so why not enjoy a free one every day? Performers from around the world come to show off their talents. They change often and can include trapeze and flying trapeze artists, high speed roller skating, juggling, acrobatic, aerialist, and clowns. Location: Circus Circus, Carnival Midway, performances start daily at 11 a.m. The Bellagio lobby feels more like an art museum with the breathtaking scene of the garden. The well-maintained garden includes plants, flowers and trees that change with every season. Beautiful, colorful glass sculptures hang from the ceiling. Location: Bellagio, inside the lobby, 3600 Las Vegas Blvd. To have the ultimate Vegas trip, visit downtown Vegas or “Old Vegas.” Fremont Street is more budget friendly than the strip. Hotels are cheaper, you can find better deals for food and drinks, and there’s a lot lower-limit tables for gambling. Besides sightseeing, there is also a nightly light show every night that’s completely free. Location: Fremont Street. Right outside of the Mirage hotel, is the legendary erupting volcano. The fire that comes out of the volcano is synced with powerful, bold music. Location: Mirage, Begins at 8 p.m. and runs every hour until 12 a.m.
I’ve always tried to find ways to save money on vacations and traveling without sacrificing a fun time. There are also certain places that people avoid because they seem pricier to visit than others. Which in many cases, can be true. But even those more costly destinations still have ways to save money. Besides the free things to do in Las Vegas, here are other ways to save in Las Vegas. Take advantage of hotel amenities. There’s so much going on in Vegas, often people overlook where they’re staying. A hotel can offer a beautiful pool, work out facilities, or even access to spa amenities for hotel guests such as a steam room and showers. Research room packages. Some hotels offer packages in addition to basic accommodations. This can include food vouchers, show tickets, spa services, and more. If you’re planning on doing any of these, it may be more affordable to book in a bundle. But before you do, check into the actual cost of each so you know if it is really a deal. Also consider if your hotel offers free shuttle service from the airport, which could save you money. Travel during the off-season. Vegas is a year-round destination so there’s not really an off-season. However, you may find better deals during November and December, specifically, between Christmas and New Year’s Eve. Like many destinations midweek trips are usually less expensive than on the weekends. Stick to a budget. Whatever your budget may be, stick to it. Vegas is a place where it is easy to spend more than you think and much more than you intended on. Purchases add up fast especially when you’re putting any money into the slot machine. Whatever you plan on spending money on, whether it is meals, shopping, gambling, drinks, or entertainment, keep track. Use frequent flier miles. If flights from your destination to Las Vegas are expensive, you may want to consider using frequent flyer miles. For more, see How Many Frequent Flyer Miles Do You Need to Fly for Free? Look for deals. Don’t go without scouting out the deals first. Check for deals online and consider calling the hotel directly to see if they can offer a better rate. What are other free activities to do in Las Vegas? What about cheaper, lower cost options? What are your budget-friendly tips on where to stay, dine, and what to do while visiting Las Vegas?